Stolpersteine, they're called - a German word that means "stumbling stones." Over the past 20 years, the German artist Gunter Demnig has embedded more than 50,000 cobblestone-sized concrete cubes, each topped with a brass plate bearing the name and dates of a single victim of Nazi Germany, in streets and sidewalks across Europe. Now these stones of remembrance have arrived in Lithuania. On the 75th anniversary of the Holocaust, the Lithuanian Centre for Human Rights is spearheading the installation of 19 stones in the cities of Vilnius, Kaunas, Siauliai, and Panevezys. On a Tuesday at the end of August, the artist himself could be seen on busy Vokieciu Street in Vilnius, installing a stone in honor of Fania Lewando (1888-1941), owner of a famed vegetarian restaurant that once stood on that spot. Not far away, on Rudninku Street, another stone honors Yitzchak Rudashevski (1927-1943), who was imprisoned in the Vilna ghetto at the age of 14 and murdered at Ponar, the mass killing site not far from Vilnius. His diary has been translated into several languages. Jurate Juskaite of the human rights center believes the stones project is essential. "It seemed necessary to bring this project to Lithuania and start a conversation about our past," she said. "We think it is important that the stones are brought by an organization that is not Jewish. The Jewish community did a lot. Now it's our turn. The time has come." The artist and the leaders of the Lithuanian project stress that the placement of the stones is symbolic, not intended to be a full accounting of the Holocaust. 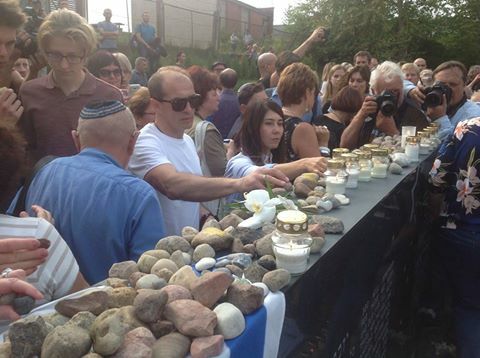 "We clearly understand that these nineteen stones do not represent the scope of the tragedy at all," Juskaite said. For nearly seven centuries, Jews and non-Jews in Lithuania lived side by side mostly in peace. Yet following the Soviet incursion of 1940 and the German invasion of 1941, a land of relative harmony became a place of inconceivable brutality. By the end of the war, more than 90 percent of Lithuania's 220,000 Jews had perished. Today, Lithuania's Jewish population is only about 4,000. During the nearly 50 years of Soviet rule after the war, Jews all but disappeared from Lithuania's public discourse. With independence in 1991, that began to change. The stones project is part of an ongoing effort to integrate Jewish heritage into Lithuania's national narrative. "We consider commemoration of people who suffered during the Holocaust as our contribution to considering the tragedy of Holocaust as part of our collective history," said Birute Sabatauskaite of the human rights center. The story that must be told includes "the loss of people, as well as the responsibility" for that loss - the participation of Lithuanians in the Holocaust. Most of the stones throughout Europe commemorate Jewish victims of the Holocaust. Others honor other victims of Nazi persecution, including Sinti and Romani individuals, homosexuals, Jehovah's Witnesses, anti-Nazi resisters, the disabled. The names on the Lithuanian stones were suggested by the Lithuanian Jewish Community and the Vilna Gaon Jewish State Museum. In addition to Lewando and Rudashevski, they include Samuel Margolis, a radiologist imprisoned in the Vilna ghetto; Isakas Anolikas, a cyclist who represented Lithuania in the 1924 Olympics; the renowned sculptor Jacques Lipschitz; Samuel Petuchauskas, longtime vice mayor of Siauliai; and Urijus Rozovskis, a pediatrician who voluntarily accompanied children rounded up in the 1943 Children's Action in the Siauliai ghetto. One Siauliai resident, Rasa Navickaite, stated that "it goes without saying that these stones in Siauliai should be not two and not ten. Before World War II, Jews accounted for nearly 30 percent of the population of the city. Today there are only 100." Juskaite views the installation of these 19 stones as only a beginning. "We hope that it will become the starting point," she said, "and that people will initiate the installation of more stones on the pavements in Lithuania." There's no doubt that anti-Semitism is alive and well in Lithuania today. Yet an opposite tendency - a desire among Lithuanians to remember and honor the Jewish past - is also plain to see. 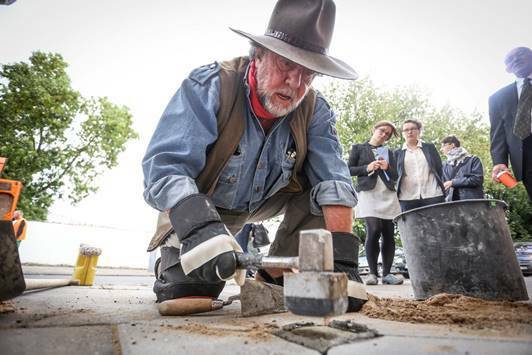 The stolpersteine project is part of a proliferation of Jewish remembrance projects launched in this anniversary season throughout the country. In the town of Moletai, for example, hundreds of people, including the president of Lithuania, held pebbles and candles as they joined in an August 29 march, retracing the steps of some 2,000 Jews forced to their deaths 75 years ago. In Kaunas, composer Anton Degtiariov and civic activist Richard Schofield created The Kaunas Requiem, a musical composition honoring victims of the Holocaust. The town of Anitscai held a Jewish festival. The towns of Ukmerge, Merkine, Vilijampole, Seduva, and Birzai held remembrance events. In several towns, local citizens were invited to read aloud, one by one, the names of former Jewish residents - a ceremony developed by an informal group of young Lithuanians called Vardai. Of the stolpersteine project, Sabastauskaite says, "I hope it will help us to get rid of the discourse 'they' and 'us,' and think instead of our people, whom we lost during Holocaust." For information about sponsoring the installation of a stone: www.stolpersteine.eu.